It’s almost the season for heart-shaped chocolates, playlists about love and rows and rows of teddy bears asking you to “wuv me”. With so many incredible accommodation options for couples, South Africa is a dream romantic getaway. 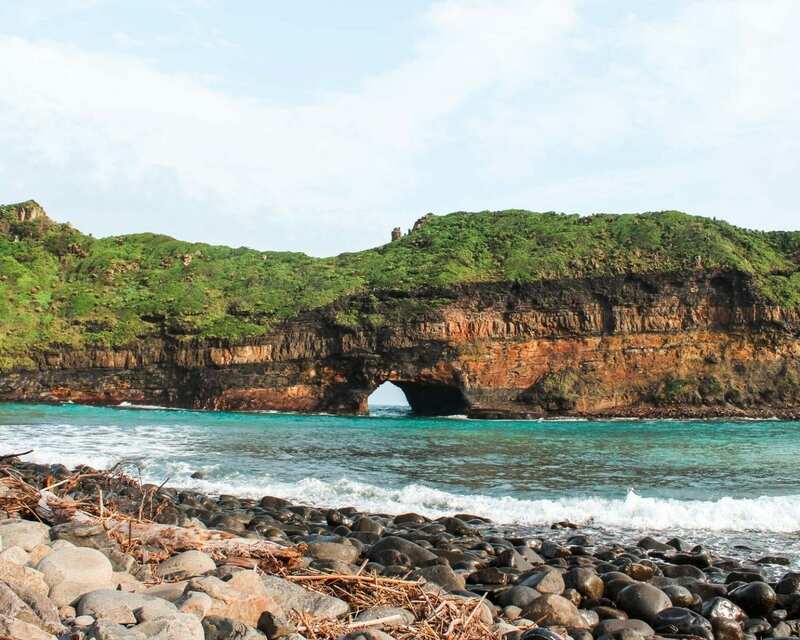 Whether you travel to the rugged coastline of the Eastern Cape or the secluded wilderness of Magoebaskloof, there are tons of things to see and do and beautiful hotels for every budget. 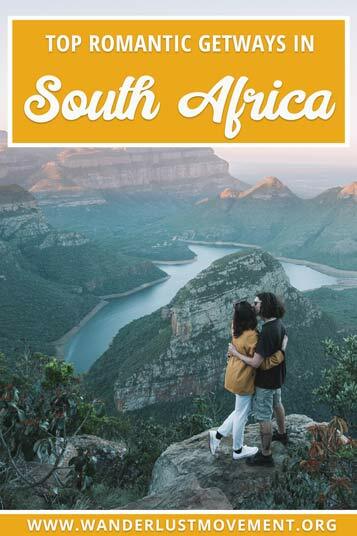 If you haven’t planned your romantic getaway in South Africa yet or you’re looking for inspiration for any other time of the year, I’ve got you covered. I’ve included some of my favourite budget-friendly stays over the last few years (that might only cost a couple of hundred Rand, but still pack a wow factor) and for those looking to splurge for a special occasion, I mixed in a few mid-range to luxury locations that don’t cost more than your monthly rent. Here are my top romantic getaways in South Africa! Hitgeheim is a beautiful eco-reserve that’s only minutes away from Addo Elephant National Park. It’s the only game reserve in the world where you can see the Big 5 as well as the Big 7! The luxury chalets are stylishly furnished and come with private wooden decks that look out onto the citrus orchards and countryside. While it’s not the cheapest romantic getaway in South Africa, it packs a lot of value. 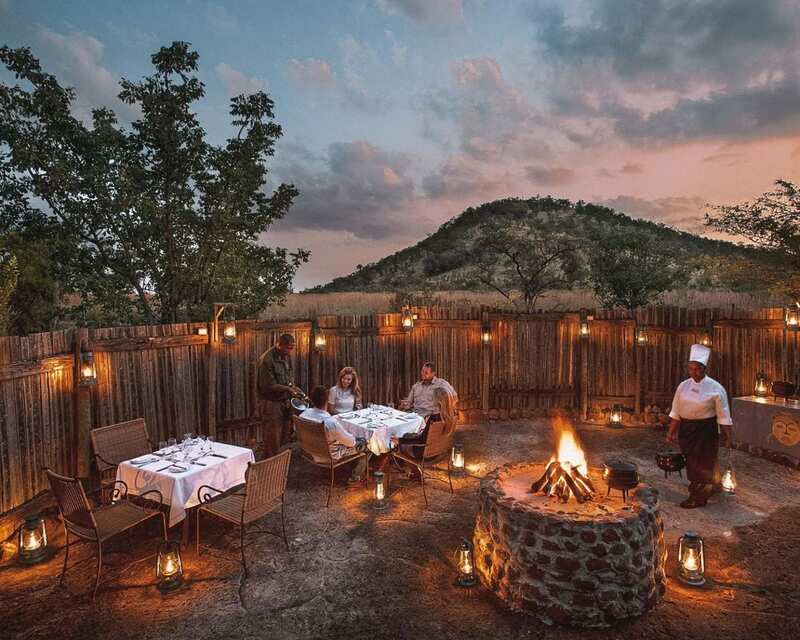 Hitgeheim offers incredible packages that include morning and evening safaris, breakfast and dinner at their gourmet restaurant and a choice of their luxury or superior rooms. Even if you’re past the age of dirt cheap travelling and you want to be as far away as possible from drunk 20-somethings – Tube ‘n Axe is not your average backpackers. Greg and I spent the weekend in one of their luxury tents. 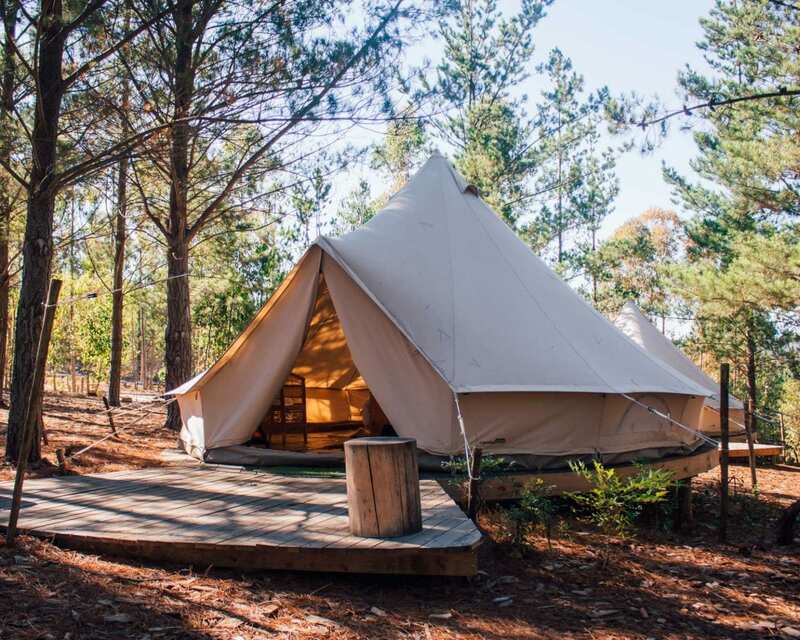 It comes with a beautiful outdoor bathroom, your bed comes with a romantic towel swan and each tent is situated in a secluded spot giving you all the privacy you need. The backpackers is only a 10-minute drive to Tsitsikamma National Park. You can spend your romantic rendezvous tubing down Stormriver, scuba diving, hiking the first 6km of the Otter Trail or walking along the park’s suspension bridges. I think I can get away with saying that the Wild Coast is one of the most romantic destinations in South Africa. There’s something magical about its rugged coastline, indigenous forests and the fact that civilisation is far, far away. With colourful Xhosa huts dotted along the landscape, it’s the perfect escape for travellers that want to experience an authentic part of South Africa that hasn’t been touched by the rampant tourism you see in Cape Town. While Umngazi does market itself as a family-friendly resort, I included it in this list because of their deluxe sea-facing bungalows. Set apart from the main hotel, it’s an adults-only haven for guests after seclusion. 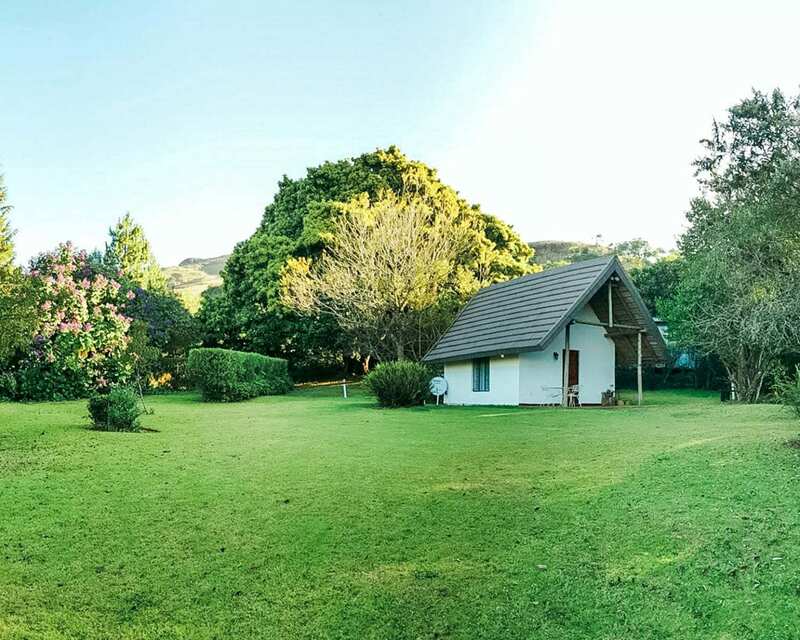 With only three units in the area, you’ll have all the privacy and tranquillity you need for a romantic getaway in the Eastern Cape! If you’re searching for the ultimate romantic getaway in Magaliesburgiesburg – head to African Pride Mount Grace Country House & Spa. It’s located in the Magaliesberg mountains and is only 80 km from Johannesburg. While it is a splurge, you can expect nothing but the best during your stay. The hotel has three on-site restaurants to choose from, a fitness centre, an award-winning spa and is only a short drive away from the Cradle of Mankind. If you’re really after premier privacy, you can upgrade your room to a private villa that comes with its own pool and spacious living area! 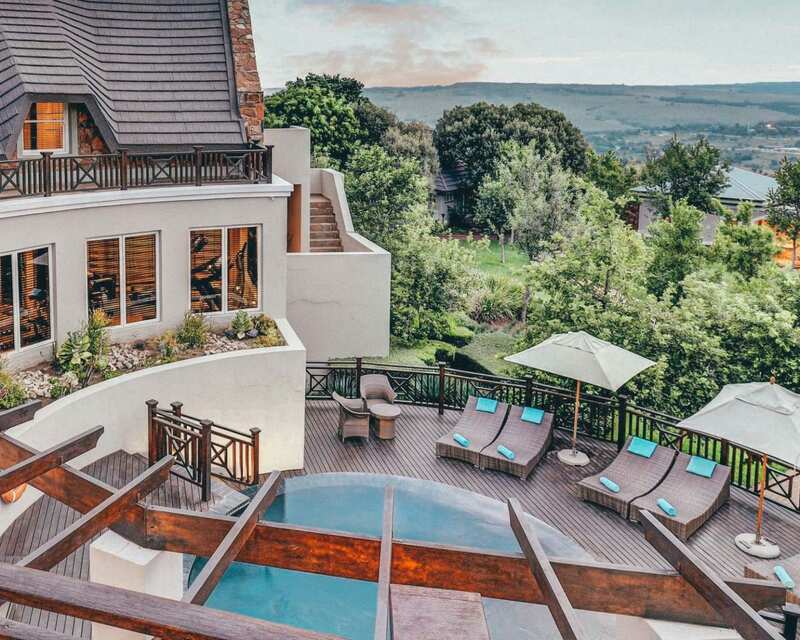 It’s not every day that you can leave the hustle and bustle of Johannesburg for a beautiful lodge located on the slopes of an ancient volcano. Kwa Maritane is one of the best mid-range accommodation options at Pilanesberg National Park. 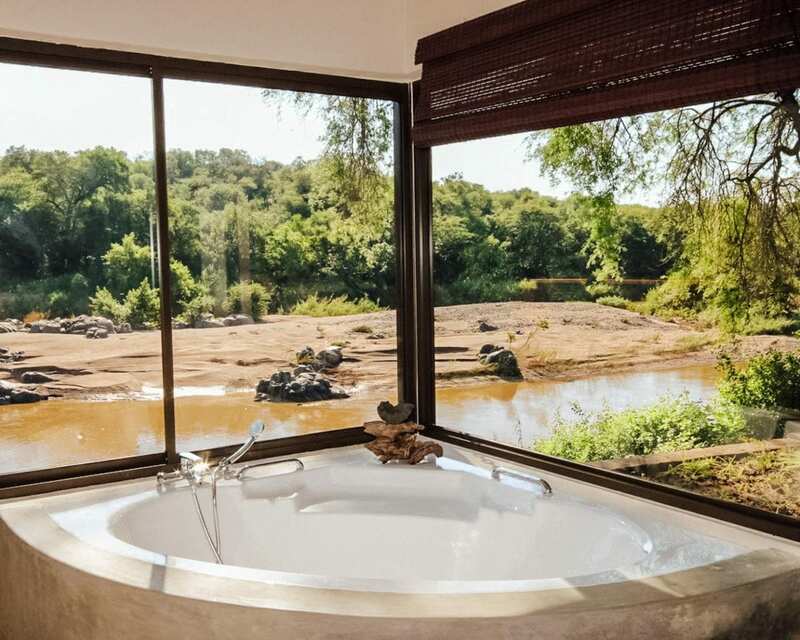 It has two gorgeous swimming pools that overlook the surrounding bush, an underground hide for up-close wildlife viewings, a full-service spa and Big 5 game drives. But what makes Kwa Maritane one of the top romantic getaways in South Africa is its beautiful outdoor restaurant. After the sun goes down, the seating area is lit up by dozens of lanterns with a roaring fire in the center. Greg and I spent our first New Years Eve together at Amphitheater’s famous Smoking Dragon music festival. We came back a few months later to hike Tugela Falls and decided to upgrade from their camping facilities to one of their private rooms. I think Amphitheater Backpackers is absolutely breathtaking property. You’re surrounded by the Drakensberg mountains, there’s a giant lake to jump into and the decor for the rooms and common areas is Afro-fusion at it’s best. While there aren’t any shops nearby, you can make your own food at the communal kitchen or sign up for their three-course dinner option. There’s delicious vegan food on the menu and the bartenders know how to make a decent cocktail. 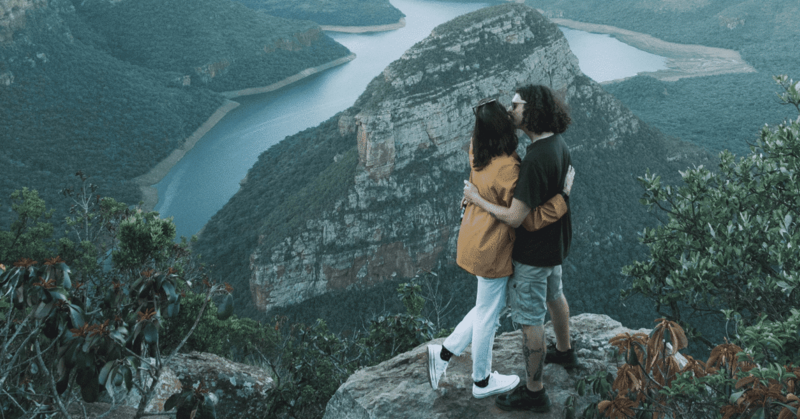 It’s the perfect budget-friendly romantic getaway in KZN for active couples that want no-frills and plenty of hiking adventures. Looking for a romantic getaway from Durban? Check into Montusi Mountain Lodge! It’s one of the most bougiest (I’m aware that’s probably not a word, but let’s go with it) accommodation on this list. You can expect five-star services like a nightly turn-down, homemade chocolates, and haute cuisine dinners. It screams opulent luxury and romance! If you can’t decide which of the suites to choose, I’d go with their Mountain Suites. It’s only R 500 more than their standard rooms but comes with so much more. 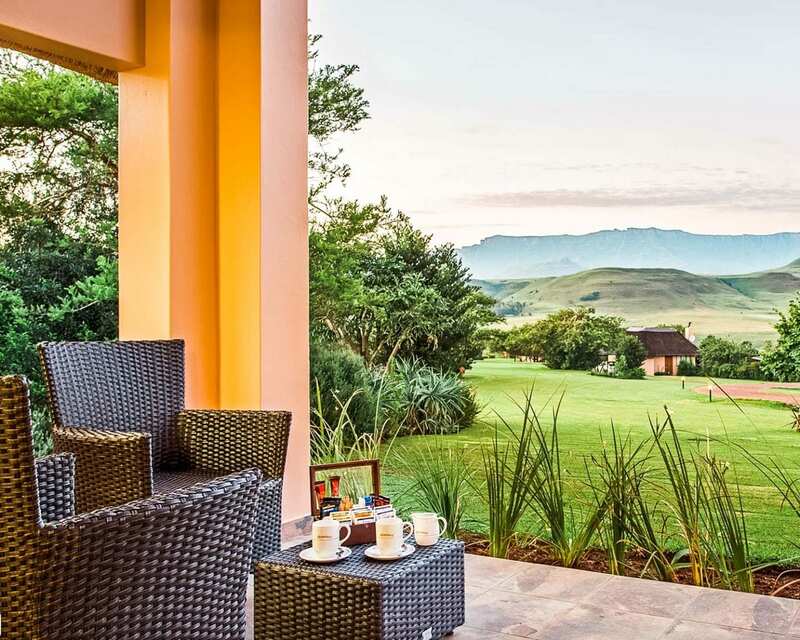 You’ll have a larger suite, a kingsize bed, a huuuuge bath and you’ll have a majestic view of the Northern Drakensberg from your private patio. Fun fact: My first date with Greg was a week-long backpacking adventure down the South Coast. Our first stop ended up being Mantis and Moon Backpackers after hearing about it from a friend in Durban. 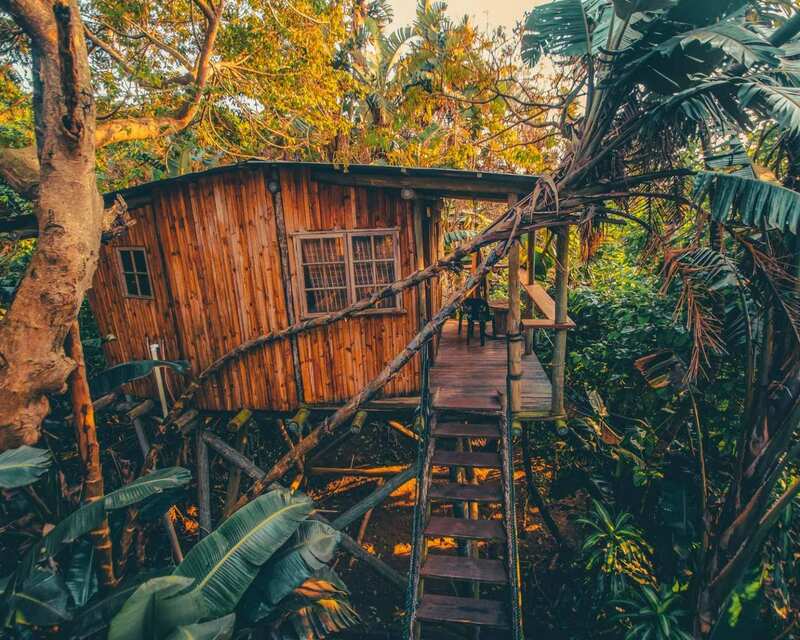 The dorm rooms are in tree houses, the on-site yoga studio is hidden deep within the forest, and it’s only a five-minute walk away from Umzumbe Beach. But what set’s this property apart from the rest are the cabins. The chalets have no walls, only four giant glass windows – giving you uninterrupted panoramic views and total immersion into nature. 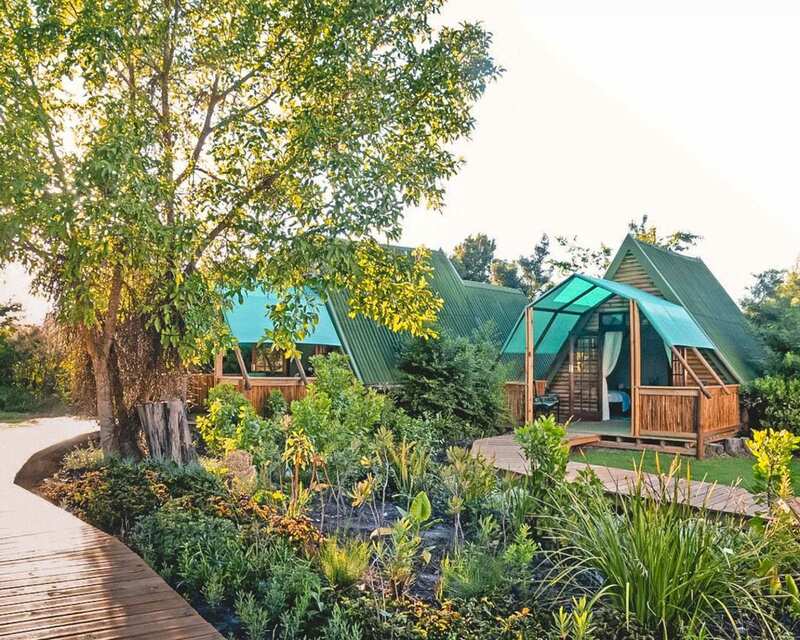 With the glass cabins starting at R 705 per night, it’s one of the most affordable romantic getaways in South Africa! Bushriver Lodge is an affordable romantic getaway in Limpopo that knows a thing or two about romance. Located on the Olifants River and is a prime location to base yourself to explore some of South Africa’s top destinations like the Kruger National Park and Blyde River Canyon. 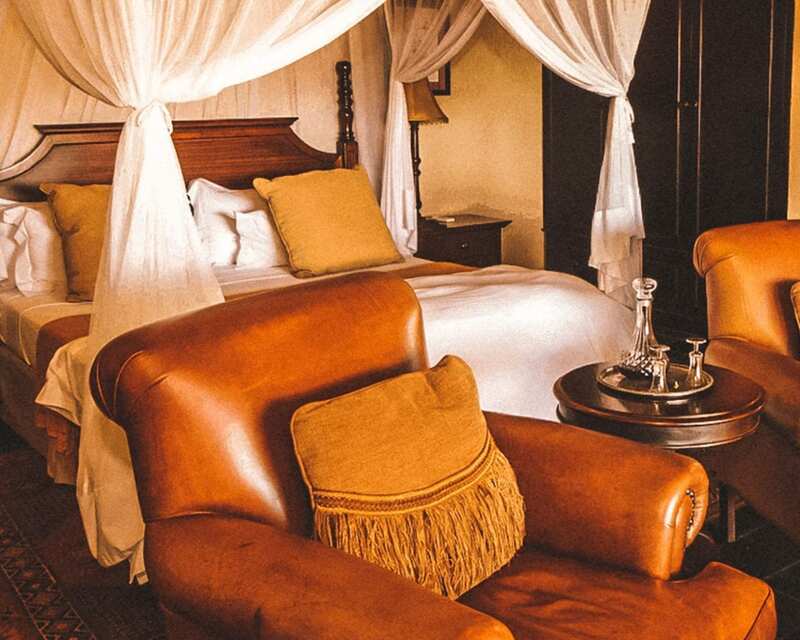 Choose from their range of luxury en-suite accommodation, each with views of the river and nearby bush. Gain bonus points by enquiring about their bush dinners. It’s set up in a dry riverbed especially for you and your partner. Tres Romantique! For a romantic getaway in Limpopo, you can’t wrong with a stay at Magoesbaskloof Adventures! While it’s known for its incredible ziplining canopy tour (which is one of my favourites in South Africa), I recommend spending the night in one of their chalets. 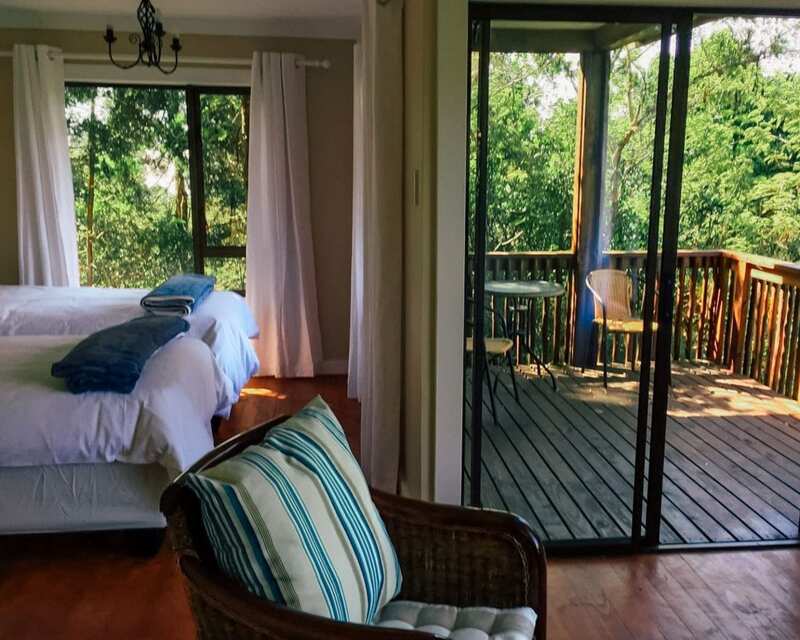 Located on the edge of the Letaba river gorge, you’ll have beautiful views of the indigenous forest and mountains from your private deck. There’s also hiking trails that start from the property as well as other adventurous activities like tubing, canyoning, mountain biking and abseiling. You’re also only a short drive away from a few restaurants in the area! One thing to keep in mind though is closing your windows and doors. I made that mistake and came back later that night to a few creepy crawlies as roommates. Wild Forest Inn is a beautiful stand-alone cottage that’s minutes from the Panorama Route‘s top sights. Greg and I stayed here on our first attempt to see God’s Window in 2018. While the weather wasn’t on our side, we couldn’t have asked for better accommodation. The cottage was super cozy (picture mountains of blankets), the owner baked us some fresh scones as a welcome gift (!) and there were braai facilities (flying that South African flag high). It’s the perfect option if you’re after a budget-friendly romantic getaway in Mpumalanga. Plus it’s the only cottage on the property so you won’t have to worry about noisy neighbours! Gods Window is 14 minutes away. Pinnacle Rock is 11 minutes away. Bylde River Canyon Lookout Point is 36 minutes away. Lisbon Falls is 15 minutes away. 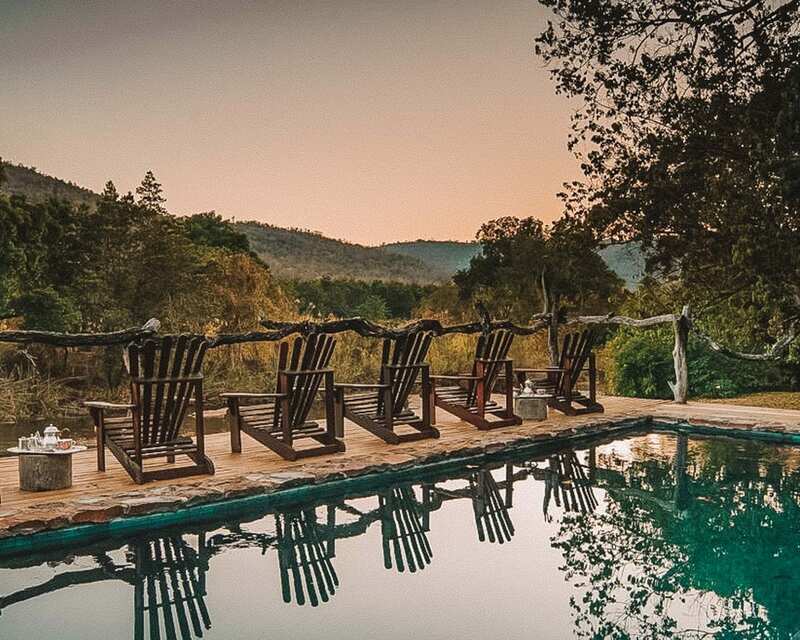 Summerfields Rose Retreat is the ultimate romantic getaway in Mpumalanga. It’s a five-star property that boasts two award-winning restaurants, sprawling macadamia, and litchee orchards, a beautiful spa and they’ve even launched their own signature gin. Located ten minutes away from the Kruger National Park and only a short drive to the Panorama Route, it’s the perfect destination for couples looking to relax, indulge and soak up South Africa’s incredible natural heritage. Choose from their 12 luxury tented suites or opt for their unique forest room. If you and your partner are avid outdoor lovers – you can’t go wrong with a romantic getaway to Blyde Canyon Resort. 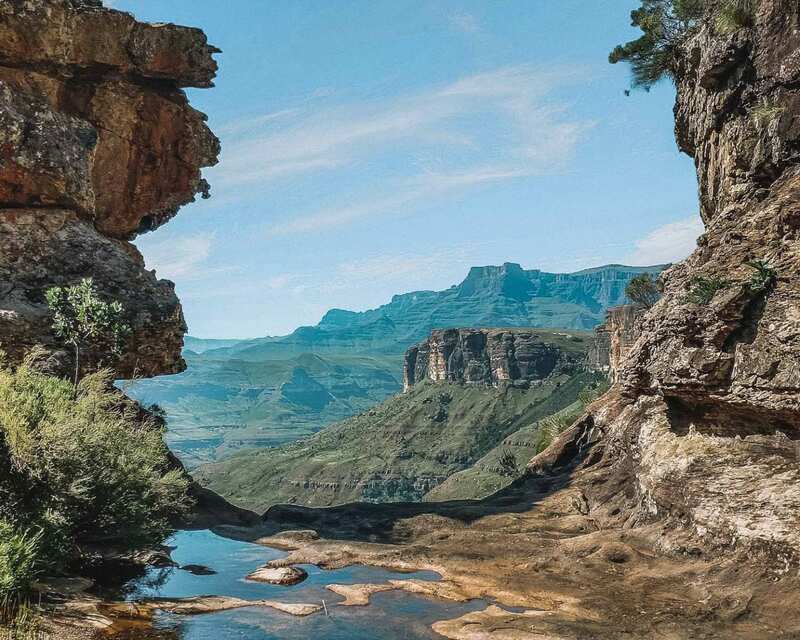 It’s the closest property to the famous Blyde River Canyon and boasts plenty of hiking trails that will let you explore the natural wonder without the crowds. I highly recommend tackling the Leopard’s Trail to get to the World’s End viewpoint! The resort offers a range of accommodation options to suit your budget. Pack your tent and stay at one of the campsites or splurge and experience their 3-star chalets. There are hiking trails within walking distance from the rooms, an on-site restaurant, and a massive pool. Kagga Kamma is one of my dream romantic getaways in South Africa. 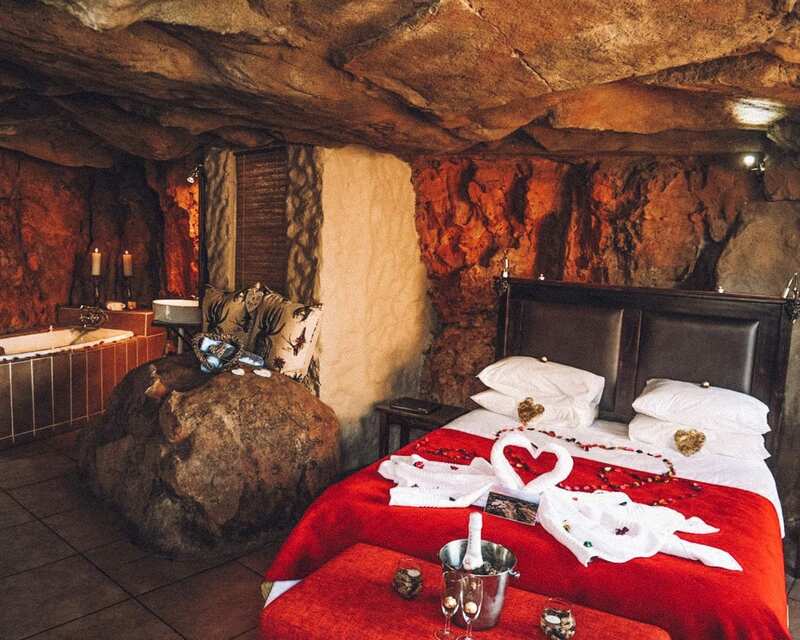 It made its way onto my bucket list when I heard about the property’s incredible open-air star suite and cave rooms. The star suites are located amoung the nature reserve’s rock formations and overlook the fynbos plains. With no ceiling, you’ll have a panoramic view of the night sky and a private outdoor bath – the perfect spot for relaxing and counting shooting stars. If you’re not quite ready to sleep outside, book one of the cave suites. Each room is carefully constructed to integrate into the natural sandstone formations and seamlessly blend into the environment. Spend your romantic getaway in the Western Cape exploring the hiking trails, going on a stargazing tour and relaxing at the on-site spa. It took me a while to get into the whole glamping thing. I was a firm believer that I wanted dirt under my fingernails, uncomfortable air mattress and the annoyance of setting up a tent. After all, isn’t that the price you pay to become one with nature? While my inner hippie is still alive and well, Cherry Glamping opened my eyes to the luxury I was missing out on and I haven’t looked back since. I was lucky enough to be one of the first people to stay at the property when it opened. After being invited by Cape Canopy to join their full moon canopy tour, I spent a night at Cherry Glamping and loved every rustic second. The tents are super spacious and cosy! The communal dining area is beautifully decorated with so much thought and detail put into each piece and the bathrooms will blow your socks off. The bathroom huts are made entirely from wood with windows looking out onto the beautiful hills surrounding Elgin, and industrial finishings that complete the rustic feel Cheery Glamping has expertly captured. Sometimes I worry about the state of the world and presidents and Master’s degrees and bond loans and how to get chocolate icecream out of white t-shirts and ill-fitting bikinis and being on time and not being too early and remembering to reply and medical aids and the strange squeaking sounds of a new car. . These times are not the times when I’m in a bathtub filled with copper-coloured mountain water in the middle of a forest with a Tracy Chapman song stuck in my head. Pictured here is us playing ‘treehouse treehouse’ at Teniqua Treetops and brainstorming an action plan on how to break the news to reception that we never plan on leaving. I first heard about Teniqua Treetops from my friend Taryn. Her fiance took her there for the weekend and ended up proposing in one of the most romantic places in South Africa! Situated in the middle of the forest, the couple treetop suites are hidden amongst the lush foliage and over incredible views of the gorge. My favourite part of this property is the bathrooms! Located on the deck and surrounded by glass windows is a massive sunken bath that can easily fit two people. It’s the perfect spot to indulge in a bubble bath, sip on some bubbly and count the twinkling stars. 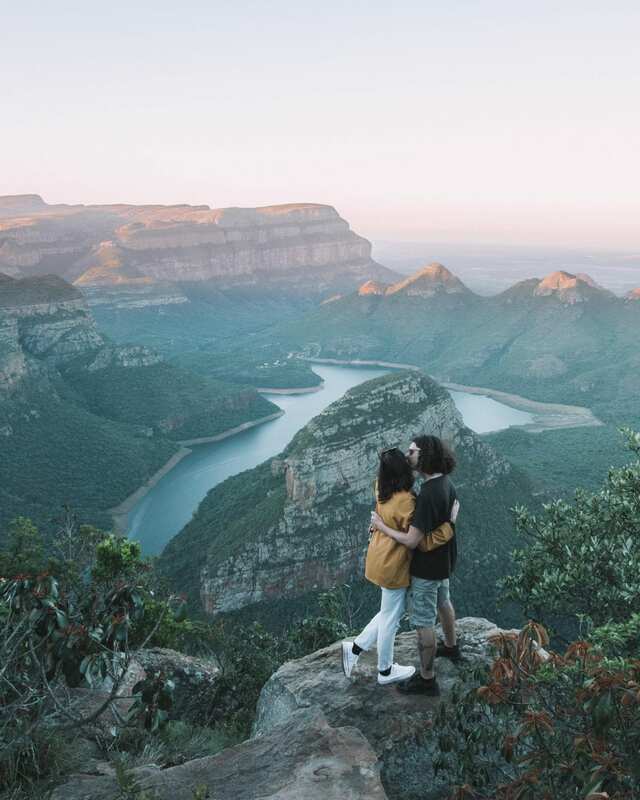 What are your top romantic getaways in South Africa? Let me know in the comments below!